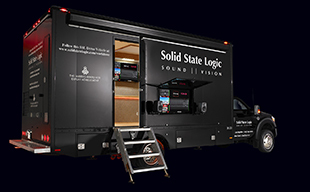 OXFORD, ENGLAND - Solid State Logic, the world’s leading provider of tools for creative audio professionals, is proud to announce the launch of its new C100 HD PLUS and C10 HD PLUS digital broadcast consoles at the 2014 NAB Show (Booth C2317). SSL’s digital broadcast console range has an enviable reputation for sonic excellence, refined user control interfaces, innovative software features and streamlined integration within complex networked and automated broadcast infrastructure. The new ‘Plus’ versions of the acclaimed C100 and C10 consoles bring together new features and added value consolidation of SSL Production Assistant software to offer users the most powerful and flexible systems SSL has ever produced. The new C100 HD PLUS Large Format Broadcast Console is designed to offer a complete production solution for News and Sports in a single standard high power configuration. Whether the application is an automation controlled web channel, through to the largest of sports productions, the new standard processing configuration at the heart of the C100 HD PLUS console delivers more processing than ever before in an SSL broadcast console. SSL’s third generation digital broadcast console is the most technically refined system available anywhere in the world. Redundant Blackrock Processor cards in a compact 2U rack process 588 audio mix paths, with 256 channels of 6 Band EQ, and 284 channels of Dynamics with 512 channels of integrated MADI I/O. The centre section penthouse of the C100 HD PLUS features a new 10-inch screen, which can be used to display any HDMI video source and enables the user to select from a wide range of metering options. The console can be specified with SSL’s own LMS-16 Loudness Monitoring system to provide comprehensive, highly configurable 16 x 5.1-channel Loudness and True Peak monitoring. The control surface has also been re-designed to facilitate clearer channel identification in a wider range of lighting conditions. The new C10 HD PLUS is ‘out of the box’ the world’s most powerful Compact Digital Broadcast Console. With frame sizes from 16 to 48 faders, the self-contained fanless console can be built into vans for ENG operations, specified for Network scale sports productions or is ideal for all-round production demands in mid-scale broadcast facilities. The simple, button-driven surface is easy for new operators while a new feature set provides all the features a broadcaster needs for the most sophisticated production. New ‘Plus’ features provide the established and proven C10 platform with a new level of performance, making it a great investment for facilities with plans to grow. Integrated into the C10 HD PLUS, the Blackrock Processor card offers 216 audio paths, with 160 channels of 6 Band EQ, and 188 channels of Dynamics with 512 channels of integrated MADI I/O. The new C10 HD PLUS also features a redesigned fader panel colour scheme. The standard configuration of both consoles offers the complete portfolio of SSL’s powerful Production Assistant applications, which help streamline broadcast production by automating and integrating key production tasks. ‘Dialogue Automix;’ ‘5.1 Upmix;’ ‘Production Automation Interfacing;’ ‘DAW Control’ and SSL’s unique integrated audio spot playout system, ‘C-Play’ are all standard features at the heart of the most powerful production platform. System options include a scalable 48 port MADI router for multiple console installations and large-scale I/O support with external control from VSM and other third party controllers, TCP/IP-based Networked audio via the SSL MADI Bridge and LMS-16 multi-stream Loudness Metering.